This DVD is designed for people who are experiencing and recovering from illness. Taught by Nadirah, a cancer survivor and professional belly dancer, this program will lift your spirits, exercise your body, and relax your mind. Nadirah knows first hand how important it is to maintain a strong body while dealing with serious health issues. Her amazing story of belly dancing through chemo will inspire you. She has divided this DVD into several mini workouts of varying degrees of difficulty so that you will be able to find a program that is right for you even on the worst of days. 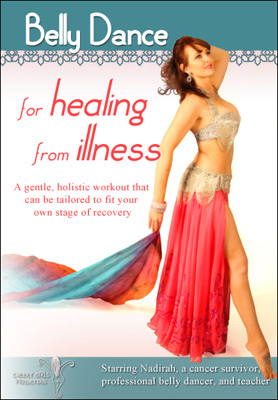 She starts off with a medium-paced warm up then delves into the belly dance basics. Then she takes you through a series of short belly dance routines that target different specific parts of the body. Dividing body parts into practice sessions allows you to specifically target the healthy regions of your body that you want to move. For example, if you are recovering from a surgery on your hip, you can skip right to the upper body section – or even just do a modified belly dance from a chair. In addition to dance, Nadirah leads you through several yoga-based workouts of varying lengths and intensities. She also does a meditation exercise that will encourage relaxation, body awareness, and overall health. Of course, you should always consult your doctor before starting a new exercise routine, especially when your body is vulnerable. Please remember that all exercises on this DVD are just suggestions and that you should always listen to your body if something does not feel right.